HockeyTown USA- sounds nice huh? Kind of like our moniker: "The State of Hockey" How did Warroad's Hockey Town USA come to be? Whom is the rightful owner to this? Detroit, Buffalo, Warroad or St. Paul? I have heard it all- seen it all in writing- Hockey Town USA is in Detroit- it's right there at Joe Louis's Arena with HockeyTown emblazoned across the center face-off circle. Wait a minute- I thought that Warroad was Hockey Town USA? After all I once stood below the towns water tower myself where it' s painted right on there: "Warroad HockeyTown USA". Hockeytown is a nickname for the city of Detroit, Michigan, which arose in 1996 thanks to a marketing campaign by the city's NHL franchise, the Detroit Red Wings. The nickname, over time, has gained national and international recognition. The "Hockeytown Cafe" in Detroit commemorates the nickname. The Red Wings organization did research prior to adopting this title to see if they could make this claim. Nicholas Cotsonika writes about this in Red Wings Essential: Everything you need to know to be a real Red Wings Fan. Cotsonika mentions that the Red Wings have won more championships then any other US based NHL team, iconic players like Gordie Howe and Ted Lindsay played for the Red Wings as the justification for the Red Wings to adopt this nickname. Professional hockey began in the state of Michigan. The nickname has become a point of pride for Red Wings fans as the NHL acknowledges in their own publications. According to Sports Illustrated, Saint Paul, Minnesota can also be called Hockeytown, due not only to the NHL team (Minnesota Wild) but also its college, high school and youth programs. At the end of the SI article the fact that the low attendance and poor attendance that caused the Minnesota North Stars to abandon the state should not disqualify St. Paul from claiming the nickname "Hockeytown" is mentioned. 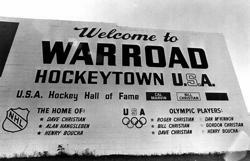 Warroad, Minnesota has also been called Hockeytown, USA over four decades prior to the Red Wings' use of the name. As of the 2006–2007 season, there has been a grassroots movement in Buffalo, NY (home to the NHL's Buffalo Sabres) to label Buffalo as "The New Hockeytown" due to the overwhelming fan presence outside HSBC Arena during games, as well as throughout the community. Mayor of Pittsburgh Luke Ravenstahl wanted usage of the "Hockeytown" moniker included in a bet over the 2008 Stanley Cup Finals with Detroit Mayor Kwame Kilpatrick. Kilpatrick refused. His staff stated that "We can't do the Hockeytown bet... that is a trademark and a brand" and that the name is a trademark of the Red Wings. I always thought that when someone made something it was there "invention" so to say- Alexander Graham Bell- telephone, Thomas Edison- light bulb, etc. So if Warroad was using the moniker "four decades prior to the Red Wings use of the name" why doesn't the town of Warroad have the registered trademark and not the giant: Ilitch Holdings? Unfortunately for the town of Warroad (population 2,000 in 1999) it wasn't a trademark. After the Detroit Red Wings won the Stanley Cup in 1998, the organization copyrighted the term "Hockeytown." Word of this marketing foolishness reached Warroad- the one, true Hockeytown and initially people in Warroad appeared to be more bemused than outraged by the audacity of the Red Wings' action. But the calm could change in a heartbeat if anyone from Detroit comes to Warroad and insists that the "Welcome to Hockeytown U.S.A." signs at the town entrance come down. If that happens, townspeople would grab their Christian Brothers hockey sticks - formerly produced in Warroad - and the brawl would get messy. Everyone in Minnesota knows that the real HockeyTown USA is Warroad...The town where hockey legends were made including: Cal Marvin, Henry Boucha, Rube Bjorkman, Dan McKinnon, Blane Comstock, Larry Olimb, the Christian family including Olympic hockey legends: Gordon, Roger, Billy and Dave Christian and recent Olympic and NHL stars Gigi Marvin, T.J. Oshie and Brock Nelson. Christian Hockey Sticks (formerly of Warroad now Roseau - 11/BOA Hockey Sticks), and the storied Warroad Lakers and Warroad Warriors. 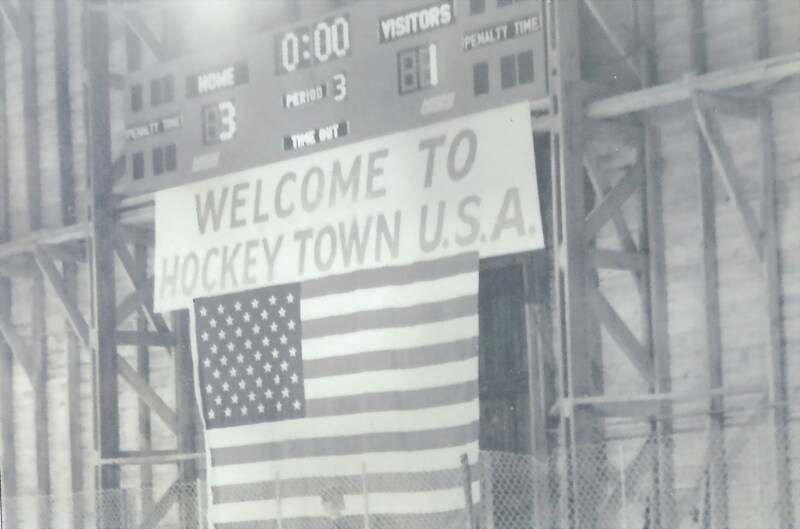 Warroad- "The First & Original HockeyTown USA"
"Now, like millions of Americans, I've spent some time with Minnesotan's lately - because I was watching the Olympics. (Laughter) Minnesota sent 19 athletes to the games. (Applause) That's tied for second of any state, and they did us all proud. It is not shocking that Minnesotans might be pretty good at the Winter Olympics. 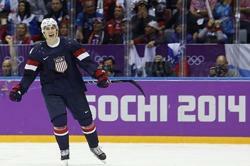 (Laughter) What is particularly interesting is that, once again, the tiny town of Warroad proved that it really is Hockeytown, USA, thanks to T.J. Oshie and Gigi Marvin, who we're just so proud of. And T.J.'s shootout performance against the Russians I might say I enjoyed a lot. (Applause). I even tweeted at him about it..."